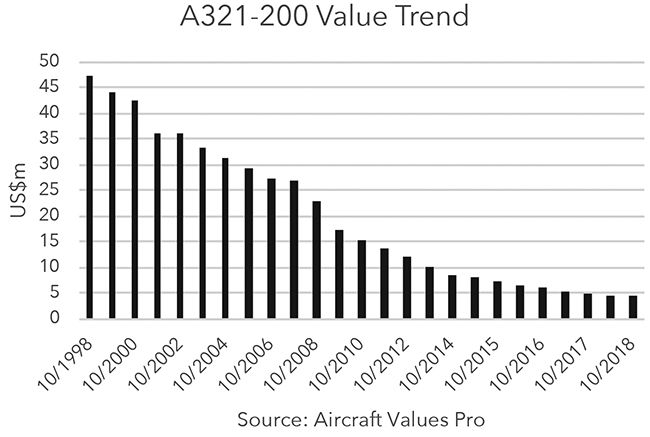 The behavior of A321-100 values over the last 20 years has clearly illustrated the problems that an initial variant can face if the specification is lacking. The IAE engine is the V2530-A5 and allows the pilot to choose between thrust levels of 29,000lbs and 30,000lbs depending on take-off condition s. The engine is derived from the V2500-A1. Both engines are FADEC controlled. Other minor changes to the A321-100 compared with the A320 include the redesign of the fuel system, reducing the weight by 40kgs; wider wheels have been fitted to provide for the heavier aircraft. A new ram air turbine was installed to compensate for the longer fuselage. There were only ever some 90 A321-100s produced and there are now some 62 remaining in service primarily with Lufthansa and Alitalia. There are a total of 18 operators and remarketing has always been an issue with such a restricted operator base both in terms of operators and the concentration in Europe. The aircraft initially had a value in excess of $45 million in the late 1990s which is only marginally less than the value of a new A321ceo. Values inevitably fell in the aftermath of 2001 but managed to stage a recovery in the mid 2000s. Since then values have experience a significant decline such that they are barely worth more than the value of the engines.